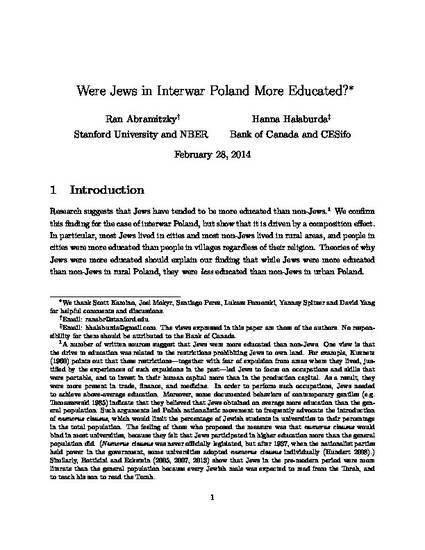 Were Jews in Interwar Poland More Educated? Research suggests that Jews have tended to be more educated than non-Jews. We confirm this finding for the case of interwar Poland, but show that it is driven by a composition effect. In particular, most Jews lived in cities and most non-Jews lived in rural areas, and people in cities were more educated than people in villages regardless of their religion. We find that while Jews were more educated than non-Jews in rural Poland, they were less educated than non-Jews in urban Poland.